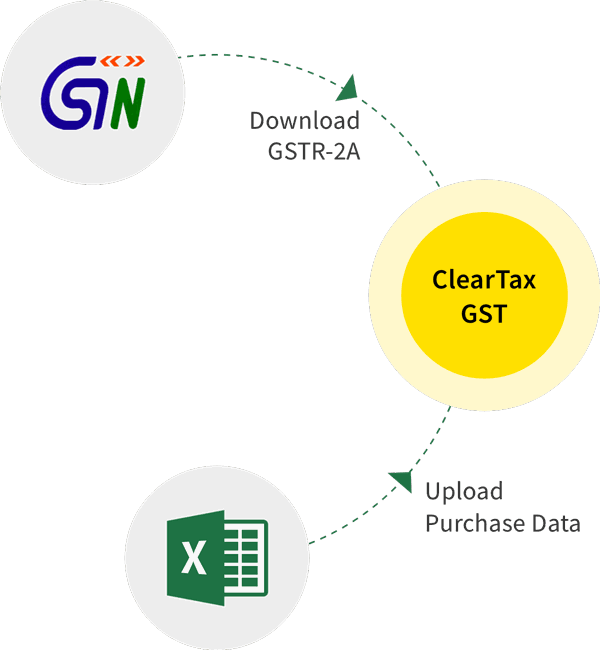 GST is here, and businesses are still trying to understand the changes required in their current systems to accommodate the new compliance model. On this note, we bring you our impact analysis on something which is very near and dear to us; or, rather to our stomachs –the restaurant and food industry. 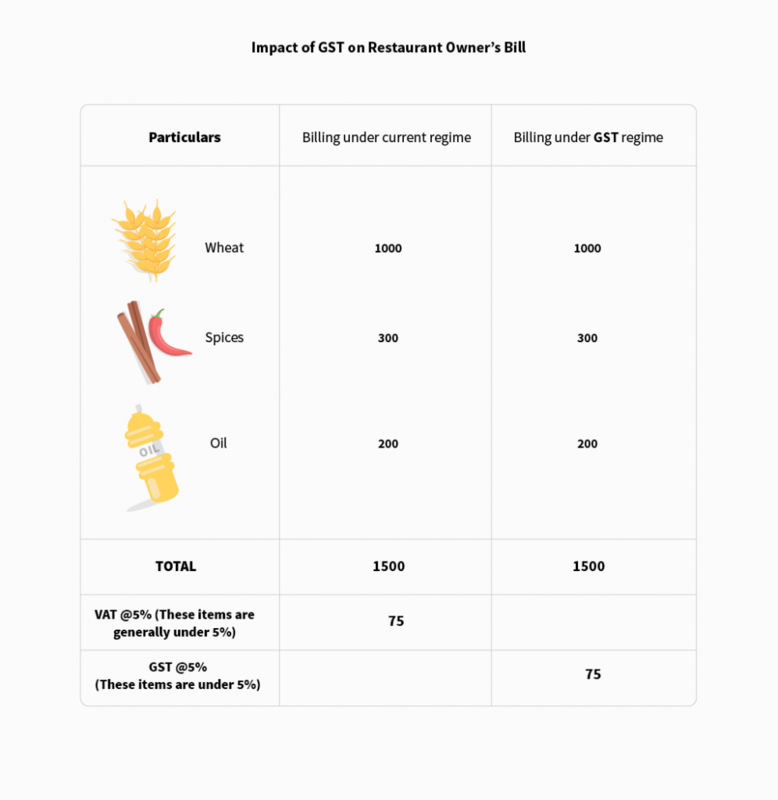 Here we will try to explain how the restaurant bill will look under GST and what are its implications for the end consumers, the owners and the overall industry. According to the National Restaurant Association of India’s 2013 India Food Service Report, the current size of the Indian food service industry is ₹2,47,680 crore and is projected to grow to ₹4,08,040 crore by 2018 at the rate of 11%. This growth is further fueled by the growth of the great Indian middle class. Rapid urbanization, growing awareness of western lifestyles, more women joining the workforce, and higher disposable income were some of the factors that contributed to the growth of the restaurant industry. As a result, we find ourselves waiting in queues in most of the restaurants during the weekend. As you can see above, the numbers look promising for the restaurant and food industry in the days following GST. As an end consumer, we hardly pay attention to our food bill in these restaurants and most of us are not even aware of the components included in it. 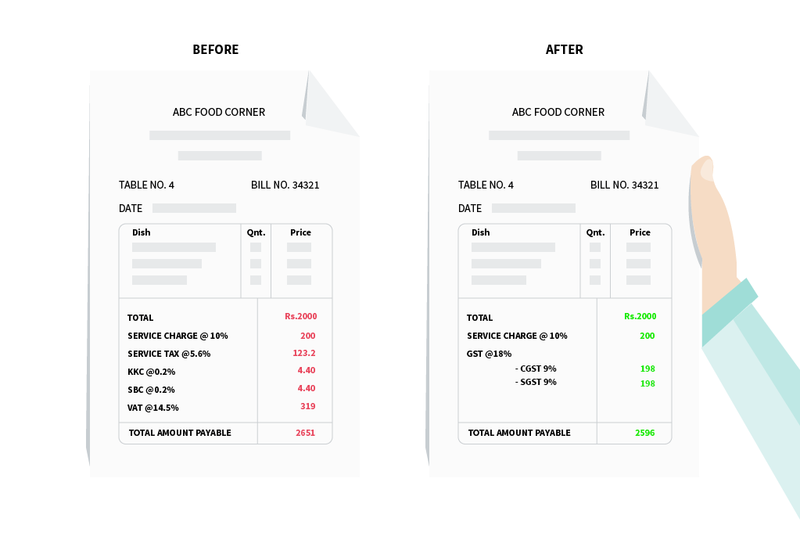 If you revisit your food bill from the pre-GST fine-dine experience, you’ll find Service Tax, Service Charge, VAT being added over and above the food value. VAT: This is the tax charged on the food portion of your bill. Service Charge: This is a charge applied by the restaurants and not by the government. THIS IS NOT A TAX. It should not be confused with service tax as this is an income to the hotels. Service tax is not an income and merely a tax collected from you and submitted to the government. However, the rates under GST are vastly different than what you would find before the tax policy change. Let us look at these changed rates below. In the GST regime, the Service Tax and VAT amount will be subsumed into one single rate, but you may still find service charge doing rounds on your food bill. So, at a standard rate of 18% under GST, a consumer will save around Rs. 55 on a transaction value of Rs. 2,200. Here, we have assumed that VAT is applicable at 100% of the value without any abatement. Furthermore, if we see the effective rate of tax under VAT regime, it sums up to around 20.5% which will come down to 18%. Now in the above example, the total amount payable to the tax authorities under the current regime sums up to ₹950. However, under GST, net outflow from the pocket will be ₹250, thanks to the reduced rates, thus his working capital will be enhanced. Thus we can fairly conclude that GST will bring reasons to rejoice for both consumers and restaurant owners under the new regime and we will have more reason to explore the new food joints in our neighbourhood and pamper our taste buds.